« Silver jewelry: what is the best way to combine them? To this day, all the collections of Hermes jewelery – the high genre of the Haute Bijouterie and the more casual genre of the Bijouterie – were somehow built, formed and developed around the branded themes of this French Fashion House, namely around the theme of horse harness or around the grafted unskilled themselves. And suddenly Pierre Ardi, the creative director of the Hermes jewelry department, presents the Niloticus set, named after Crocodylus niloticus, or the Nile Crocodile, not only a living predator and still living in the waters of the great river, but also in honor of the ancient Egyptian god of water and spill Neil Sebek, who, as is well known, had the head of the crocodile itself with a human torso. However, the same name “nilotikus” (along with the category of “alligator”, “caiman” and “pig”) is also the type of crocodile leather from which the most expensive Hermes bags are made. In short, the whole thing in the guise of a crocodile, it is his skin that reproduce necklaces, earrings and a cuff bracelet from the new set. However, the “skin” of the crocodile in the jewelry arsenal of Hermes does not appear for the first time. A year ago, Ardi recreated the four iconic Hermes handbags in gold and diamonds, and one of these miniature jewels (which really could be worn as an accessory and as a lipstick bag or credit card), namely the Kelly bag, was created from skin “crocodile. Rather, its gold surface imitated the valuable skin of this predator, and imitated it so skillfully that even then we thought that this is a motive worthy of further development! And the sequel was not long in coming. In the collection of Haute Bijouterie even a wide bracelet appeared, the surface of which evenly reproduced the characteristic texture of the scales of a predator from the class of reptiles. But in the set of Niloticus, Ardi went further, along the path of greatest resistance, that is, the complexity of the artistic design, and hence its technical embodiment. 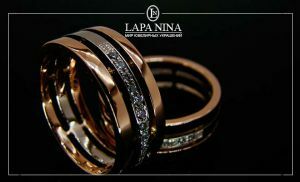 Necklace, earrings, wide bracelet and ring are created from separate scales “skins” of pink gold, which are first made independently and then merged into a single precious canvas. So a necklace in the form of a wide collar or a shirt front consists of 112 individual scales of different sizes. 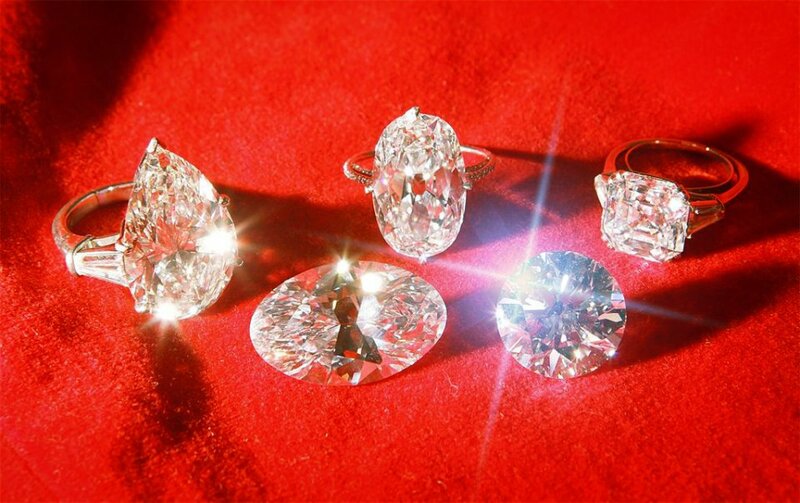 Each of them was first cut out according to the exact sample and likeness of the sketch and wax form of the future decoration, polished, and then fixed in a general symmetrical composition, in the places of fastenings of which one can see by a colorless round diamond. Thus, 56 elements were created on each side of the central axis of the necklace, which represents the semblance of a certain rod – if we continue in the spirit of ancient Egyptian mythology, then, apparently, the rod of the high priest or priestess. This baton has a technical function – to naturally connect two parts of the canvas, and, of course, a decorative one (according to the rules of jewelry art, any technical card is played as a decorative element). So, along the whole length of this axis are located from top to bottom – a round diamond, oval iolite, pink tourmaline, again a round diamond, then a green peridot-cut cushion, then a line of diamonds of different sizes, and finally, at the bottom there is a drop-shaped iolite topped diamonds cut baguette and another round. 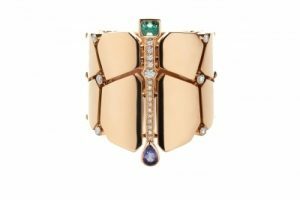 A cuff bracelet and a wide ring are created on the same principle as a necklace: symmetrical compositions of rose gold scales extend from the central rod to both sides. In the bracelet, they are arranged in three rows, and in its center rod the peridot is cut on top of a pillow, and on the bottom is beryl-cut pear. And in the combining two rows of “scales” in the ring, the pillow is also crowned with a peridot-cut pillow, and at the other end – a drop of iolite. 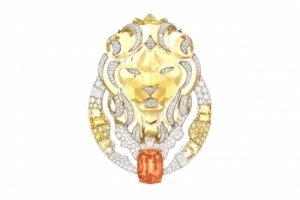 The design of the earrings is somewhat different, because it is a pair of jewelery – from identical, studded with diamonds and ending with a drop of beryl ending below, three scales of the same pink gold are moving in different directions. By the way, the design of the necklace is incredibly mobile, and the bracelet and the ring are incredibly soft, just due to the special fastening of each element with the other. By its flexibility, it resembles the tanned skin of a crocodile, and therefore should be felt when wearing second skin – Hermes jewelers did everything to get as close as possible to this feeling. In the House of Hermes, they make such a parallel around this precious metamorphosis: if the alchemists of the past sought to turn lead into gold, then the alchemists of the present, designers and jewelers, possessing enough gold, try to turn it into something different, special, and in this case very successfully. Well, what about the central element of each of the four jewelery – why is it not a rod of supreme power wrapped in the scales of the Nile Crocodile? Yes, in general, the entire headset is imbued with a certain sacred spirit of the sacred monster, a demonstration, if not of its superiority, then of a special position, for which it is worthwhile to dress in Niloticus.